Has your Outlook program become slow and bloated over time? If so, it's not surprising, because as your e-mail store and associated files get larger, Outlook typically takes longer to load, operate, and exit. The problem is that Outlook stores all of your e-mail (and other kinds of data) in a file called a .pst file, and as that file grows, it slows down Outlook. Weight Diet for Outlook ($30, 15-day free trial) helps solve the problem by shrinking your .pst files in a number of different ways. 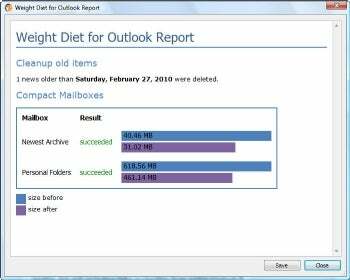 Weight Diet for Outlook will speed up Outlook by shrinking the size of your .pst file. This program finds and deletes duplicate e-mail messages and unneeded messages such as mail failure notifications, and compresses your .pst file. It also compresses file attachments and moves them out of your .pst file to your hard disk, making your .pst file smaller. To make sure you can still access the files from within Outlook, Weight Diet includes links in the emails where the attachments used to be. You click the links, which then opens the files from where they are stored on your hard disk.